Professor George Holley from Minnesota State University Moorhead recently completed a cursory inventory of a private artifact collection gathered in Douglas County, Minnesota. 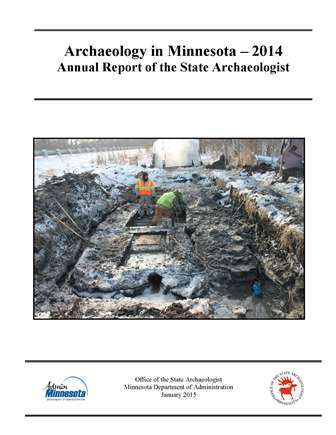 Holley, whose specialty is pottery, is seeking to better understand Minnesota’s precontact ceramic chronology. George’s report discussion focuses on the types of ceramics in the collection. 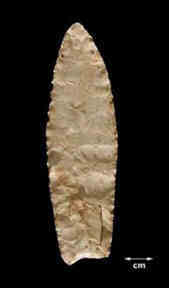 Lots of artifact pictures to browse. Click here to view his report. The annual Gopher Sate Artifact Show will be held at the Steel County History Center in Owatonna on Saturday March 21, 2015 from 9am to 3pm. The event is open to the public. There is usually a small admission fee and if you have an artifact you would like to have identified there will be lots of experts on hand to offer an opinion. This is also an opportunity to get a sense of the rich archaeological history of the region. The Steel County History Center is a great place for a show like this with lots of natural light. Click here to download an event flyer with additional information. The 2014 Gopher State Artifact show will be held this coming Saturday, March 22 at the Steele County History Center in Owatonna, Minnesota. Click here for the event flyer. The Mississippi Valley Archaeology Center (MVAC) at La Crosse, Wisconsin is hosting an artifact show at the Valley View Mall next Saturday, March 8, 2014 from 10:00 am to 5:00 pm. The event is free and open to the public. Check out this flyer for more information. 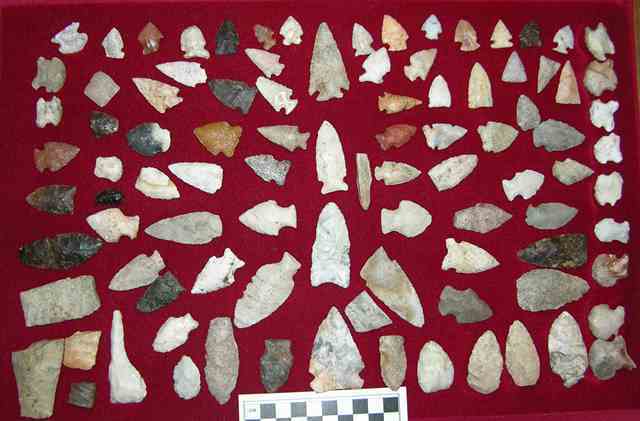 The Gopher State Archeological Society will host its annual Artifact Show at the Steele County History Center in Owatonna, Minnesota on Saturday, March 30, from 9 am to 3 pm. The Steel County History Center is located at 1448 Austin Road, on the southeast corner of the Steele County Fairgrounds in Owatonna. The event is free and open to the public. Click here for a flyer. Earlier this week I had someone show me a very unusual artifact for Minnesota, a bannerstone. Bannerstones are usually found in the Eastern United States. This link to Wikipedia provides some general information about them and their function. This particular one was found 30 years ago during a construction project. Most of the authentic bannerstones that I have seen from Minnesota, less than a dozen total, have been this rectangular shape. The material it is made from is also similar to that of some of the other Minnesota bannerstones I’ve seen before. 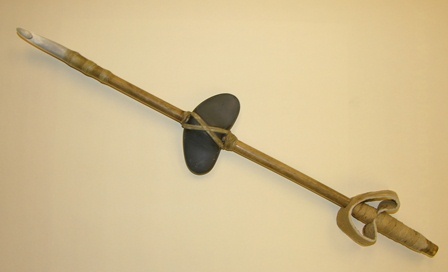 One theory is that they were atlatl weights and would have been hafted as part of an atlatl, or spear thrower, as shown in the picture below. The wood of the atlatl shaft passed through the hole in the bannerstone. 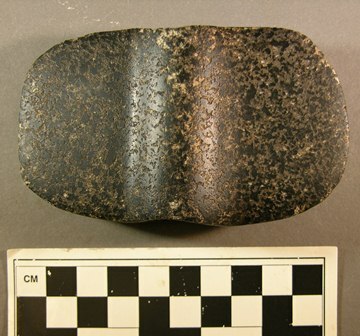 Bannerstones were used during the Archaic into Early Woodland time periods.